Day 2 of the PokerStars World Championship of Online Poker brought one of the busiest evenings that the entire series will have. Five champions were crowned, including winners of the two-day events that began on Sunday. Many well-known pros made deep runs at WCOOP glory on Monday, including Team PokerStars member Liv Boeree, and Jonathan "MONSTER_DONG" Karamalikis, who won his first bracelet by defeating a loaded final table that included Jonathan “Iftarii” Jaffe and 2011 November Niner Martin "filfedra" Staszko. The inaugural event of the 2011 PokerStars WCOOP was the second to crown a champion. The two-day tournament crossed over into Monday following a Day 1 that saw only 37 of the 7,500 players survive. The $200 six-max event offered a $1.5 million prize pool and a $225,000 payout to the eventual champion. Team PokerStars member Liv Boeree began Day 2 near the bottom of the counts with 597,000 chips, 17 big blinds, but the former European Poker Tour champ was able to quickly climb back into to contention on Monday. First, her got the best of "n1GhTFoX's" when the spiked the river, lifting her back into contention. Then she doubled again when her held up against "petter85's" to lift her above the 2 million mark. After taking down a couple of more pots to increase her stack to nearly 3 million, Boeree found herself in a dream spot against chip leader "Fisherman903" that boosted her into second place in chips with 27 remaining. With the blinds at 20,000/40,000 and a 25,000 ante, "Fisherman903" opened to 110,000 from the button and Boeree three-bet to 320,000 from the big blind with . "Fisherman903" then put in a four-bet to 1.53 million, more than half of Boeree's stack, and she moved all-in for a total of 2.9 million. Her opponent called, risking 40 percent of his chips with , and the board rang true for Boeree sending her stack above 6 million. That was her high point of the day, however. She lost around half of her stack over the next few levels and then tangled with "Fisherman903" again, only this time he reeled in the rest of her stack. The Dutchman raised to 270,000 (blinds 50,000/100,000) from under the gun and Boeree shoved for 3,185,440 from middle position. Action folded back to "Fisherman903," who called with and was flipping against Boeree's . The flop looked promising, and the kept her in the lead, but this time it was Boeree who was the victim of an ace on the river when the sent her to the rail in 18th place for $9,000. Belgium's "China_White1" was the first elimination of the final table. With the blinds at 200,000/400,000, "China_White1" raised to 1 million from the small blind and "Fisherman903" popped it to 16 million with from the big blind, enough to put his opponent all-in. "China_White1" called with and was out in front, but the board gave Fisherman903 trip queens and a pot worth more than 9 million. Then, Miguel "LOL_U_91" Use got involved by calling "BrightStripe's" 15-big blind shove with and making a flush against the "BrightStripe's" sending him out the door in fourth place. Use was up to 17.4 million, barely half of the monster stack that "Fisherman903" held. Still, Use declined the chop requests of the other three players and put his focus into increasing his stack. That decision paid off handsomely. Use disposed of "Dimka19881" a few hands later when his held up against , and he then won a massive pot against "Mrazeg" to advance play to heads-up. "Fisherman903" opened with a min-raise to 800,000 from the button and "Mrazeg" moved all-in for 9,363,031. Use then put his 26.5 million chips at risk by shipping his stack, and "Fisherman903" got out of the way to watch the 19 million-chip hand play out. Use's were in great shape against , and the board sent "Mrazeg" to the rail in third place. Use flopped a straight against the two pair of "Fisherman903," who needed to improve to survive. However, the on the turn and on the river were no help to "Fisherman903" and the lengthy battle had finally come to a close. 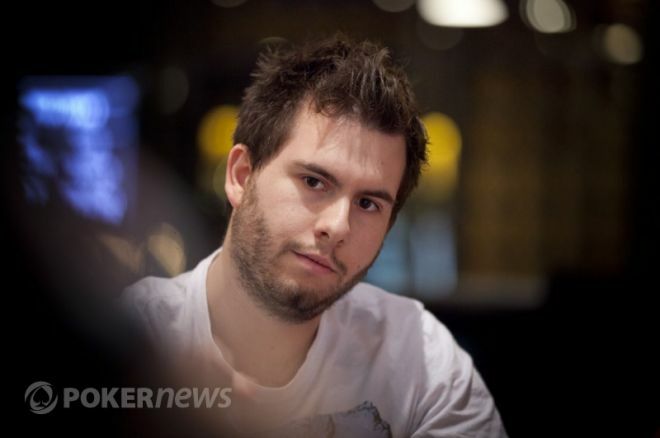 Miguel "LOL_U_91" Use earned $211,000 and his first PokerStars WCOOP bracelet. Event #3, the $200 No-Limit Hold’em Two-Day, resumed on Monday with 69 players remaining from a starting field of 10,107. Among them was Swedish pro Stefan “Mattssons” Mattsson who made a deep run but finished just a bit shy of the final table. He shoved from the small blind with into short-stacked “AGANAKTHSH77” who called with . Mattsson failed to improve, thus becoming the short stack himself. He fell on the very next hand when he shoved on the button for his remaining four big blinds with . “K_0_S_T_Y_A” called from the big blind with and got there on the river of a to send Mattsson to the rail in 14th place. Day 1 chip leader "ChiphunterTH" bubbled the final table, running a ten-big-blind stack with into “ElB@ndolero's” pocket jacks. Here were the chip counts at the start of the final table. Exiting in seventh place was “4mc4”, busting at the hands of “K_0_S_T_Y_A.” On an board,“K_0_S_T_Y_A” check-raised all-in with the bigger stack, putting “4mc4” to the test. After a few moments, “4mc4” called all-in with , leading “K_0_S_T_Y_A's” . However, the hit the river to give “K_0_S_T_Y_A” a winning flush, the elimination, and the chip lead. “Jukka862” busted shortly thereafter, three-betting all-in for eight big blinds with . “Yoggi744”, the original raiser, called with and held up with the better hand. “Bhaphom3t” got it in good with against “K_0_S_T_Y_A's” . The board, though, nailed “K_0_S_T_Y_A” as it fell to the give the Russian a winning flush. “O-Totoro” got back in the mix, scoring the next knockout with . It was bad timing for “ElB@ndolero” who four-bet shoved with , and was unable to improve. The very next hand was “Yoggi744's” last. Once again, it was a four-bet shove that ran into a big pair as the of “Yoggi744” fell to “K_0_S_T_Y_A's” , leaving two players to duke it out for the bracelet. The first non-hold'em event of the 2011 WCOOP was Event #4, the $300 Pot-Limit Omaha. With 18 players remaining, final-table chip-leader-to-be “Jamie_KK” was all-in and at risk twice. First, holding . His opponent, “kisgali”, was behind with and never caught up. Three hands later, “Jamie_KK” had to sweat top set against a flush draw on an board. Fortunately for “Jamie_KK,” the river was a blank and gave the Brit a seven-figure stack, one that was maintained all the way down to the final table. “Daddddymufff” was the first to hit the rail after raising pot from middle position. A call from “bratpack1979” in the big blind delivered a flop to the board. The chips made their way into the middle with “Daddddymufff's” trailing “ bratpack1979's” . The flopped two pair for “bratpack1979” held through the turn and river to score the first final-table elimination. Short-stacked “Mazelucky” fell a few hands later, all-in preflop with against the of “TuggiGumma.” The board ran out to give “TuggiGumma” a winning straight. “TuggiGumma” scored a second bust-out ten hands later, knocking out “steve66sp”. A three-way limped pot led to a flop that “steve66sp” bet the majority of his stack with. After “TuggiGumma” reraised all-in, “steve66sp” called and was at risk with a draw, holding . “TuggiGumma” tabled for top two pair and held through the turn and river to leave six players remaining. The largest stack belonged to “Jonny White1” with 1,689,927, while the shortest stack was Galen “Gakn29” Cranston with 1,221,540. Needless to say, it was anyone's game. Play went on for more than an hour before “TuggiGumma” fell in fourth place after making a move with as the short stack. Galen Cranston wasn't going anywhere with and improved to a straight when the board came down to bust “TuggiGumma.” The remaining three players quickly agreed to look at numbers but couldn't come to terms. Play resumed and after a good while as the short stack, “gillete” finished in third place. On a flop, “gillete” reraised all-in after “bratpack1979” bet the pot. A call from “bratpack1979” revealed for an open-ended straight draw, facing “gillete's” for bottom two pair. The turn card still kept “gillete” ahead, but the river card spelled the end. The chip counts to begin heads-up play were 5,774,350 to 2,710,650 in “bratpack1979's” favor, but the match lasted a little while before “bratpack1979” closed it out. On the final hand, Cranston min-raised to 240,000 on the button and “bratpack1979” called to see a flop. A check from “bratpack1979” led to a pot-sized continuation bet from Cranston. However, “bratpack1979” decided a raise was in order and made it 840,000 to go. Not to be outdone, Cranston made it 3,000,000 to play. A call from “bratpack1979” led to Cranston's remaining 210,000 going into the pot when the hit the turn. The fell on the river to give “bratpack1979” a winning flush, $83,518.08, and a WCOOP bracelet. Team PokerStars Online's Shane “shaniac” Schleger made a deep run in Event #5, the $300 No-Limit Hold'em Six-Max Shootout, but finished in ninth place after losing heads-up to eventual winner “Mossop7” at his table. With “Mossop7” holding a slight lead, Schleger was put to the test after seeing his three-bet re-raised all-in. Still sitting 60 big blinds deep, Schleger opted to call for his tournament life and found himself to be a dominating favorite with against “Mossop7's" . The flop kept Schleger ahead, but the landed on the turn. The river didn't save Schleger, and he was out just shy of the final table. As soon as play began, Team PokerStars Pro Marcin “Goral” Horecki proposed a deal and after about a half hour of fine tuning the numbers, the six players agreed. Out in sixth place was “1_conor_b_1” after five-bet jamming into “Mossop7's" . No ace hit the flop, leaving “1_conor_b_1” extremely short stacked. Three hands later, play was five-handed. “Juecksel” hit the rail a few minutes later, running top pair into Sal “ugritaly” Fazzino's better top pair on a flop. Fazzino's fended off “Juecksel's” as the turn and river fell. Marcin Horecki got his chips into the middle with , flipping with "nordlending's" . The Polish Team PokerStars Pro was unable to improve, finishing in fourth place. Sal Fazzino took home a third-place payday of $32,000 after busting to “nordlending,” as well. Once again, it was a five-bet shove that ran into a monster as Fazzino's five-bet shove with ran smack into “nordlending's” . Left with less than one big blind, Fazzino's tournament ended the next hand. The heads-up duel lasted 73 hands with “Mossop7” emerging victorious. On the final hand, “Mossop7” raised on the button and upon seeing “nordlending” three-bet from the big blind, shoved with the bigger stack on the button. A call from “nordlending” revealed , leading “Mossop7's” . However, the board rolled out to seal the deal for “Mossop7,” and give him the WCOOP bracelet. The $200 turbo with rebuys event more than doubled its $500,000 guarantee on Monday as 1,589 players entered one of the wildest events of the WCOOP series. With 3,130 rebuys and 754 add-ons, a seven-figure prize pool was up for grabs. Needless to say, the chips were flying throughout. Several notable players made deep runs in the event but fell short of the final table, including Team PokerStars members Marcin "Goral" Horecki (27th place) and Shane "shaniac" Schleger (83rd place). Other notables making impressive runs included Jon "Fatal Error" Aguiar, Greg "gregior" Howard, and Owen "ocrowe" Crowe, but all failed to reach the coveted final table. The action was furious once things got under way. With the blinds starting at 60,000/120,000, the average stack at the table was less than 10 blinds. That resulted in at least one player being all-in on every single hand at the final table, leading to several pressure-filled moments with hundreds of thousands of dollars at stake. The final table began with "FrankThomas8" moving all-in from early position for less than four big blinds. Action folded around to "4kinghellll," whose short stack didn't even cover the big blind, and the first of many preflop confrontations commenced. "FrankThomas8" had against the lowly of his opponent, and the pair only improved on a board of , sending "4kinghellll" to the rail in ninth place. You couldn't even blink before the next flurry of eliminations. On the very next hand it was "FrankThomas8" all-in again, this time with a three-bet from the big blind over the initial raise of 2011 World Series of Poker November Niner Martin "filfedra" Staszko from the small blind. Staszko decided he was priced in and called with , which trailed the of his opponent, but Staszko hit a four on the flop and held on to eliminate "FrankThomas8" in eighth place. Then, after the blinds increased to 100,000/200,000, George "gp18089" Pittas opened to 436,000 from under the gun and "ShippityShip" called all-in for 428,778 directly behind. Everyone else got out of the way and Pittas escaped a disaster when his rivered a flush against "ShippityShip's" on a board of . "Lotos64" then made his presence known by doubling up twice to take the chip lead from Jonathan “Iftarii” Jaffe. On the second hand, Pittas moved all-in for 2,565,731 from middle position with and "lotos64" called from the big blind with . The better hand finished on top, and "lotos64" took control with more than 3.4 million chips. Meanwhile, Pittas was crippled and made his exit on the next hand because his couldn't improve against Staszko's . The lead then shifted again as "medmar" eliminated Jaffe in fifth place in a three-way all-in that also involved "lotos64." With the blinds now at 150,000/300,000, Jaffe opened the action by moving all-in for 2,288,704 with . "Medmar" called for his remaining 1,175,622 with , and "lotos64" called with in the big blind, having both covered. The flop brought a set of sixes for "medmar" and the Argentinean went on to collect a pot worth more than 3.8 million. "Lotos64" scooped the side pot, and Jaffe exited in fifth place. Laying low during the madness was Jonathan "MONSTER_DONG" Karamalikis, but his tablemates certainly didn't forget that he was there. The dangerous Australian pro stayed afloat with a pair of double-ups and then claimed the chip lead by eliminating Staszko in fourth place. He then sent "lotos64" out the door in third place when his outflopped , setting up a heads-up match against "medmar." Two hands later, it was over. Karamalikis moved all-in with , "medmar" called for his remaining 2.6 million with , and the board of secured the Aussie's first WCOOP bracelet along with a prize of $179,569. "It's all over! The DONG ships WCOOP #6, an awesome way to begin the series," Karamalikis posted via Twitter after his victory. His previous best result on PokerStars was a third-place finish in a $2,000 SCOOP event in May for $101,860. Notable Finishes: Greg "gregior" Howard (12th - $8,647), Jon "FatalError" Aguiar (17th - $4,925), Marcin "Goral" Horecki (27th - $4,269), Owen "ocrowe" Crowe (47th - $2,845), Shane "shaniac" Schleger (83rd - $2,080).